I don’t eat that much pasta, considering I’m half Italian. I’m a bigger fan of risotto, but I do have my favorite pasta dishes, and one of them is a simple weeknight throw-together of shrimp, feta, and grape or cherry tomatoes (sort of Italian-Greek!). Firm fleshed fish would work well if you don’t have shrimp, especially, I think, chunks of swordfish. Really hard up? Try good quality canned tuna. If I have some spinach or arugula on hand, I throw that in, too, and fresh basil would not be an unwelcome addition either. I heat some olive oil, and sauté shrimp and garlic, and when that’s barely cooked, add the halved tomatoes. 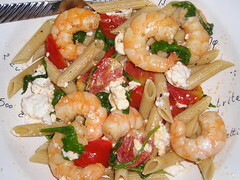 As soon as the shrimp are fully cooked, and the tomatoes are “collapsing” a little, I fold in crumbled feta and the spinach or basil if I have it. I turn off the heat and cover the dish while I drain my pasta, saving some of the water in a measuring cup. I pour the pasta into the skillet with the shrimp, toss it all, and add about a half cup of the pasta water. A shower of Parmesan would be a nice touch, but I usually forget to add it. I usually prefer dried pasta over fresh; my favorite is De Cecco, but I’ve found I also like Barilla Plus, too. For me, 100% whole wheat pasta is too heavy for most dishes, except things like pasta with chard and walnuts, i.e. no tomato sauce. And sometimes I like an egg pasta, but it is usually still the dried kind. If I want fresh or filled pasta, such as ravioli, I head to Lucy’s Ravioli Kitchen, where just about anything I’ve tried is delicious, including breads and prepared foods.